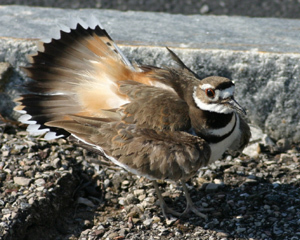 Description: Adults have a brown back and wings, a white belly, and a white breast with two black bands. The rump is tawny orange. The face and cap are brown with a white forehead. They have an orange-red eyering. Tail extends beyond wing tips at rest. Sexes are similar in appearance. 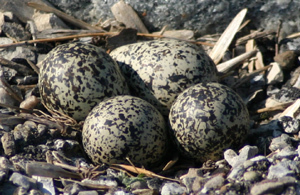 The chicks are patterned almost identically to the adults, and are precocial — able to move around right after hatching. Similar species - all other plovers lack the two black breastbands. Very young Killdeer have a single breastband and could be confused with Piping, Wilson's, Snowy or Semipalmated Plovers, but are usually still downy, have black bills (any Piping or Semipalmated Plover having a breastband will also have an orange bill with a black tip), and are colored above like the adult (eliminating the paler Piping and Snowy).